This story was updated at 5:46 p.m. EDT. 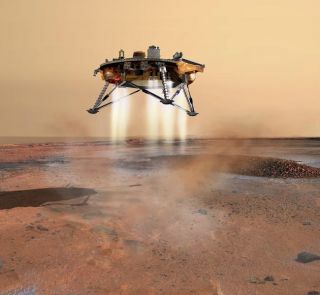 PASADENA, Calif. – Excitementand nerves are both running high among NASA scientists as they prepare for thePhoenix Mars Lander?s planned Sunday arrival at the red planet, missionscientists said today. The spacecraft isstill in good shape and on track as it nearsthe finish line of its 422 million-mile (679 million km) trek to theMartian arctic. ?Well this is exciting, a very exciting day,? said Doug McCuistion,director of the Mars Exploration program for NASA, at a press briefing at hereat the agency?s Jet Propulsion Laboratory (JPL). ?The atmosphere here at JPL iselectric.? But in addition to excitement, Phoenix scientists are getting a strongcase of nerves. ?The anxiety level is getting high,? said Phoenix project manager at JPLBarry Goldstein. ?I?m getting a real case of the heebie-jeebies now,? echoed Joe Guinn,Phoenix mission manager at JPL. The craft, now just over 1 million miles (about 1.6 million km) from Mars, is slated to land in the north polar regions of Mars in theVastitas Borealis plains. Mission scientists expect to receive the signalthat Phoenix has landed on Sunday at 7:53 p.m. EDT (2353 GMT). The first imagesfrom the craft could be sent back to Earth as soon as a couple of hours afterlanding. The $420-millionmission, which launched last August, plans to digdown to the rock-hard layers of water ice thought to lie under the Martiansoil near the planet?s north pole. It is designed to test the soil and ice forsigns that liquid water existed there in the past using some of the instrumentsoriginally created for its ill-fated predecessor, the Mars Polar Lander, whichfailed before landing in 1999. A trajectorycorrection maneuver opportunity scheduled for late this evening could beskipped, mission engineers said, as Phoenix still seems to be flying true afterits last thruster maneuver a week ago. The craft has already skipped onecorrection opportunity. The team will have one more opportunity to adjustPhoenix?s trajectory tomorrow morning if required. The likelihood ofneeding to make a correction tomorrow will influence the decision to make acorrection today, Goldstein told SPACE.com. Making a maneuver today,while the landing is still almost 24 hours away, is much less nerve-wrackingthan making one tomorrow because there?s more time to see if the maneuverworked, he said. Having to make a maneuver just eight hours before landingleaves much less wiggle room. Goldstein says theseries of meetings and the work to preparefor the landing tomorrow help take his mind off of his nerves, that andeating lots of ice cream. He also said that along-standing tradition at JPL to kill the butterflies on landing day is topass out peanuts to all the people in mission control. The tradition supposedlygoes back to the Ranger missions to the moon; after the first few failed,people began to eat peanuts to calm their nerves. ?I already have thepeanuts purchased,? Goldstein said. The weather on Marsalso still looks optimal for landing day. Only one dust storm has been spottedin the area, and was actually seen directly over the landing site yesterday,but it will likely be out of the way come landing time given its current rateof movement, Goldstein told reporters on a tour of JPL mission controlyesterday. ?The good news is? that cloud has now passed over our landing site,?said Phoenix principal investigator Peter Smith of the University of Arizona,adding that mission scientists are ?watching the weather, we?re going to bewatching it throughout the mission.? What has scientistsmost on edge is Phoenix?s ?fiery entrance into the atmosphere? tomorrow, asGoldstein put it. While each of the individual systems that have to deploytomorrow, from the parachute, to releasing the back shield and firing thethrusters, have checked out so far, it?s the strict sequence that the systemshave to follow that make missionscientists most nervous. The last successfullandings on Mars were the two Mars Exploration Rovers, Spirit and Opportunityin January 2004, with the hardy robots still exploring the planet today. Phoenix won?t use thesame airbag-cushioned landing technique that brought those crafts safely to theMartian surface. Instead, it will use thrusters to slow its rapid descentthrough the atmosphere. This technique has not been used successfully since theViking mission in the 1970s and was last used by the failed Mars Polar Lander(MPL) in 1999. The mission team hascorrected many of the problems encountered with MPL, but as McCuistion saidduring the briefing, ?Mars is always there to throw those unknowns at us.? NASA's next Phoenixmission briefing will be broadcast live on NASA TV at 3:00 p.m. EDT (1900 GMT)on Sunday, May 25. Clickhere for SPACE.com's Phoenix mission coverage and a linkto NASA TV.